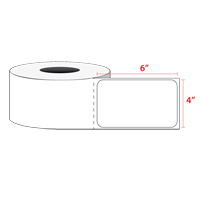 We offer popular sizes and configurations of our thermal transfer roll labels, all of which have a 3” core. 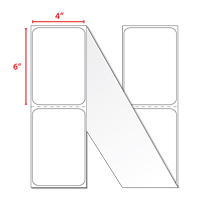 We also offer a fanfold variety in the 4x6” label size. With great price breaks on large quantity orders, we can offer you excellent deals on your thermal transfer label needs. For the manufacturing of our thermal transfer printer labels, materials that have been proven over time to print well and remain firmly secured after attachment are used. Thermal transfer labels are widely used for in-house barcode printing, but also have many other uses. These labels are great for items that need to be labeled for an extended period of time, or items that will have to withstand various weather conditions and heavy use. There are many advantages to using thermal transfer labels. They have great all-temperature and all-weather performance, due to their strong-holding adhesive. These labels possess great durability and, therefore, have a long life. Our thermal transfer labels work well with a variety of printers, including Brady, Datamax, Intermec, Monarch 9800 series, Printronix, Sato, TEC, and Zebra thermal transfer printers. Please note that these labels require a ribbon-based thermal transfer label printer. 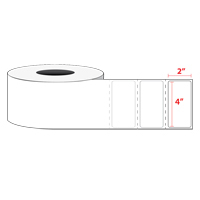 If your printer does not use ribbons, please see the direct thermal transfer labels for a compatible thermal label.